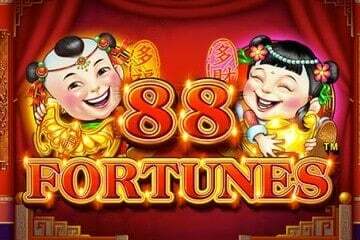 The 88 Fortunes slot has been around for many years, but you might be forgiven for only having seen it recently. That's because up until a few years ago, it has mostly been seen in Chinese casinos (in Macau), but not so much in the US. New versions of the game now adorn the Vegas casinos and very good they are, too. Orient themed slots are a great choice whenever you feel the need for a bit of luck, bundled up with some traditional features. Although it seems that the software developers will never seize launching Asian inspired games, there's always room for one more, especially since some themes are considered timeless. Regardless of how the market changes and evolves, oriental slots will never die out and players will always welcome a new addition. 88 Fortunes by SG Interactive is a classic contribution to the genre, with a twist – the slot features four Jackpots and has both golden and standard version of Chalice, Turtle, Boat, Coin and Bird icons, together with the Wild Fu Bat, one of the most notable symbols of prosperity and good fortune. 88 Fortunes slot has 243 win ways and for a combination to produce payment icons will have to be positioned from left to right, forming a string on the connecting reels. The minimum and the maximum stake amounts are symbolic. The bets start with $0.88, with the coin size set to the minimum value of $0.01, while the maximum wager is capped at $88.00. As you have already noticed, 8 is a dominant number, being one of the prominent symbols of fortune and wealth. It would be even better if RTP also ended in 8, but this is regrettably not the case and the expected return to the player is 96%. To the right of the gaming screen, the player will be able to see the Jackpot amounts, gain access to the payout table, turn off the sound or switch to Auto Play mode, with preset sessions of 10, 50, 100 or 200 auto spins. Expanding the screen will reveal additional settings, enabling the player to choose the cash amount that will stop the Auto Play mode. 88 Fortunes is not available for real money play in the USA, including California, Florida, Texas and New York. Games that are similar to 88 Fortunes are available to gamble online for cash, though, at the best USA online casinos. Fu Bat is the Wild and can, therefore, stand for all other symbols. The same icon triggers one of the Jackpots which are triggered according to the bet level selected by the player; with higher stakes, additional golden symbols are unlocked, making the player eligible for higher Jackpots. When the player triggers the Fu Bat Jackpot Feature, a different game screen will be activated, presenting the player with 15 coins. The Jackpot amount will be awarded in accordance to the 3 matching coins revealed by the players: Mini, Minor, Major, and Grand. Gong symbols will award 10 Free Spins, which can be reactivated during the feature and the low-value icons will not appear on the reels for as long as the bonus games are in progress. Finding a game with a decent RTP (even if it does not end in 8) and re-triggerable Free Spins is undeniably a major success, but if you add 4 Jackpots and bonus rounds with only high-value icons into the mix, you really hit a Home Run. Eliminating A, K, Q, J, 10 and 9 from the Free Spins is a nice touch and thanks to it you will only score big time during the extra games; that alone would be sufficient to rank 88 Fortunes highly – with re-triggerable Free Spins, the game really makes the grade. SG Interactive definitely does not fall back compared to other software developers who have been interpreting the same theme and 88 Fortunes is a worthy representative of the genre, with a few additions that make the game quite distinctive, such as Free Spins featuring only high value icons (brilliant idea!) and golden counterparts of the standard icons that can be purchased – a great way to change the slot's volatility and dynamics and adjust the gameplay to your own budget and style. Things have changed over recent years and the game, which is hugely popular in Macau and dominates the slot floor there has stated to become very big in the U.S. and many other countries, including UK and Canada. What you need to look out for is the machine with the fullest pot of money, because it means that it is more likely to pay out the jackpot soon (it might be a small jackpot, but it is still worth winning). This is really interesting, because it is so different from Las Vegas casino games, where the chances of winning a jackpot is generally the same on each and every spin. With this one, the more the pot in the jackpot, the higher the chance of winning it.